I recently stumbled upon a diet that has resulted in weight loss. Imagine that! I had been a vegetarian for 15 years only to climb in weight. This new way of eating is based on my metabolic type and I am a mixed type. Some may be protein types or carb types. A Metabolic Type is the inherited pattern of genetically-based strengths and weaknesses in the body’s fundamental control systems. Although tens of thousands of chemical reactions take place in your body daily, they are all regulated by a handful of control systems, such as the Autonomic Nervous System, the Endocrine System, the Oxidation Rate, etc. To find out what type you are, I recommend you take this free mini test or purchase "The Metabolic Typing Diet" book by William Linz Wolcott, Trish Fahey. The book describes in detail about what foods you should eat for your type. In my search for eating the right foods, I discovered many of the foods that I ate were mainly processed like bread, pasta, and grains, which were contributing to my weight gain. It became a fact-finding mission in my quest to know more. I then found Dr. Mercola's website and he is also an advocate for the metabolic typing diet. He really takes nutrition to a higher level. Basically, after reading the numerous articles on his site, my diet has drastically changed since my vegetarian days and weight loss has become a reality. I eat 50% of vegetables raw, otherwise I steam them. My diet consists of whole foods which include alaskan wild caught salmon, organic grass fed beef, organic chicken, and organic vegetables, fruits, and nuts. 1) 2 Eggs over easy (lightly cooked since cooking destroys the nutrients), sliced Squash, Mushrooms, Onions, and Tomatoes (raw or lightly sauteed with Coconut oil). I only make eggs once a week. 4) Detoxification Blend: 1 drop daily in water for internal organ cleansing. Only use this blend 2 weeks at a time. Where to Buy Whole Foods? I purchase my meats at Whole Foods Market since they offer organic and grass fed beefs. I also shop at Sprouts as they have more reasonably priced produce. Local farmers market's in your area are great for getting quality organic produce and will be more affordable than your local health food stores. I use a Turbo Oven to cook meats and veggies which can only be purchased online usually from Walmart, Target, or Dr. Mercola. It's very efficient (cooks in half time and thaws food as well) and uses less electricity than your oven. Raw Foods are foods that contain enzymes that assist in the digestion and absorption of food. In general, the act of heating food over 116 degrees F destroys enzymes in food. (Enzymes start to degrade in as little as 106 degrees F). All cooked food is devoid of enzymes, furthermore cooking food changes the molecular structure of the food and renders it toxic. Living and raw foods also have enormously higher nutrient values than the foods that have been cooked. When you stop eating cooked protein foods which require large secretions of stomach acid (which is not healthful for several reasons) our stomach doesn't produce much stomach acid. Many people who eat raw foods eat a low protein diet and are free from the stomach acid secretions and have much more energy and a lighter disposition. 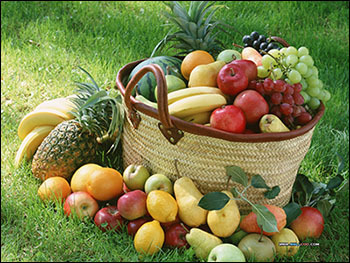 When juicing or eating fruits and vegetables, it is very important to choose to consume organically grown produce. "Conventional" produce is grown with pesticides, herbicides, synthetic fertilizers, GMO's and other chemicals that are toxic and/or harmful to your body. Organic foods are grown without the use of these harmful substances, taste better, and are more nutritious. I recommend eating as much organic food as possible. Also, it has been shown that organic food may taste better and contain more nutrition. I believe its better to eat more fresh fruits and vegetables (raw or lightly steamed) in any case. Some foods provide more nutrition and health benefits than others. These include whole foods, vegetables, fruits, and lean meats. Processed foods are not good for you as they contain hydrogenated and trans fats, and much less nutrients than whole foods or foods in their natural state. Almost all foods that come out of a box are processed in someway. Long-term consumption may contribute to disease and ill health. Foods that provide no nutritional value include diet soda, chips, and candy, and nearly anything in a package/box. People are misled by deceptive nutritional labels and general lack of knowledge of where the hidden sugars are. Americans eat far more sugar than they know. When looking at labels for sugar content, you must also look for high fructose corn syrup and dangerous artificial sweeteners. They are in a variety of foods that you might not normally suspect. Sugars cause hormonal changes that lead to overeating. Most carbohydrates that are found in processed foods, such as white bread and rice, break down to glucose and affect your body in the same way as refined sugar does. Any meal or snack high in carbohydrates or sugars generates a rapid rise in blood glucose. To adjust for this rise, your pancreas secretes the hormone insulin into your bloodstream, which lowers your glucose (sugar) level. Insulin is essentially a storage hormone, which is used to store the excess calories from carbohydrates in the form of fat. Insulin, stimulated by the excess carbohydrates in overabundant consumption of grains, starches and sweets, is responsible for all those bulging stomachs and fat rolls in thighs and chins. High insulin levels suppress two other important hormones glucagons and growth hormones that are responsible for burning fat and sugar and promoting muscle development, respectively. So insulin from excess carbohydrates promotes fat, and then wards off the body's ability to lose that fat. Excess weight and obesity lead to heart disease and a wide variety of other diseases. The ill effects of grains and sugars do not end there. They suppress the immune system, contributing to allergies, and they are responsible for a host of digestive disorders. They contribute to depression, and their excess consumption is, in fact, associated with many of the chronic diseases in our nation, such as cancer and diabetes. Next, you’ll want to gradually eliminate your intake of processed foods. Most people consume far too many processed foods in their diets. These include any food that comes packaged and ready to go such as TV dinners, instant waffles or pancakes, packaged meals, boxed lunches, etc. All of these foods typically contain hydrogenated fats to help extend their shelf life. Over time, too much hydrogenated foods can contribute to heart disease and arteriosclerosis. Healthy fats to substitute are coconut oil, avocados, and raw nuts (no peanuts as they usually contain mold which becomes an Aflatoxin that causes cancer).